Summer reviews are soo much fun! I love trying out products that really fit in well with the season. Well, being that it is summer now, it seems fitting to talk about sweat. Yep. Sounds disgusting, but with the extremely hot temperatures that we have been having, I have been giving my deodorant a run for its money. In some parts of my state, temperatures have been soaring over 100 degrees. This is why I am soo grateful for our central air conditioning. Having a newborn, it is so important to keep him cool and that has been easy in our house. Last night, our family went for our nightly walk to the local elementary school playground and it was very warm out. Both Greg and I noticed that we were both hot and sticky while walking. Welcome to July. :) Boy was I thankful for the new anti-perspirant that I had been wearing!! If you are like me, then you tend to stick with one type of deodorant because it works for you. I have a really hard time finding an antiperspirant that works for me because I am a profuse sweater. My white shirts get stains so easily and I am constantly having to treat and soak them. I have never sought medical advice about my sweating because I honestly feel that it is normal for me and that is just the way it is. Today, I would like to introduce you to Certain Dri Anti-Perspirant...the #1 doctor recommended brand for controlling excessive underarm sweating. What really intrigues me about this product is that you apply it at night several times per week. So, it isn't a daily morning deodorant like I am used to using. The reason for applying it at night is so that it can penetrate pores. This is a really great concept and one that makes alot of sense too. This is also important because most deodorants and Anti-Perspirants on the market today only mask the problem of excess sweating, rather than helping to get rid of it. So, for this review I was sent Certain Dri Anti-Perspirant Solid. I have to admit that whenever I review products like these I automatically think that they will be just like the next one...no difference. Well, this was a really great product and I am going to share with you why. I was naughty and didn't read the instructions BEFORE using this deodorant and applied it in the morning. Oh well...I was slightly embarrassed but continued on with my day. The first thing I noticed was that it smelled really nice. The scent is like light and fresh powder. I LOVED it. I am VERY happy to tell you that all day long, I did not ever feel wet and sweaty. This Anti-Perspirant stuck with me throughout the hot day and I could not detect any odor or wetness when I was getting ready for bed that night. I would love to keep using Certain Dri and probably will look into it. Certain Dri Anti-Perspirant comes in two forms-solid and roll-on and you can buy these products at mass market retail stores, supermarkets and drugstores nationwide. You can also purchase Certain Dri directly from online retailers and at certaindri.com. Certain Dri retails anywhere from $5.50 - $5.99 (solid or roll-on), which is typically 40% less than "clinical strength" antiperspirants. So, in my opinion...Certain Dri Anti-Perspirant could very well become my most-trusted and most-used deodorant brand. I am really looking forward to using this product in the hot days and weeks to come, and will definitely recommend it to anyone who suffers from severe sweating and under-arm "issues". It truly does what it claims to do and I am excited about the potential of solving my perspiration problems! 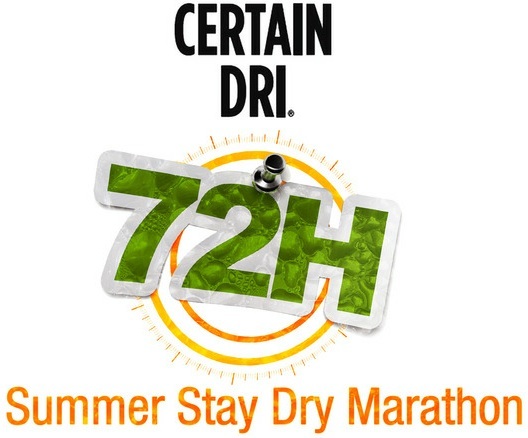 Right now on Certain Dri's Facebook page, you can enter their Certain Dri 72-Hour Summer Stay Dry Marathon! You will have the chance to win a Travelocity travel gift card, Certain Dri product and $72 retailer gift cards!! Check out the Certain Dri Facebook page for giveaway details and entry form! Disclaimer: I received no monetary compensation for this post. I did receive free Certain Dri Anti-Perspirant for review purposes. All quotes and stock photos are from the Certain Dri website and email. Prize is being provided and shipped by the sponsor. All thoughts and opinions are 100% mine. I'm currently using Dove deodorant.